Playing sports like soccer on a hot summer's day makes you feel hot. When you work harder, you feel hotter. When you stop to take a rest, even though you are still in the same hot environment, you feel cool. Why? Heat edema is swelling which generally occurs among people who are not acclimatized to working in hot conditions. Swelling is often most noticeable in the ankles. 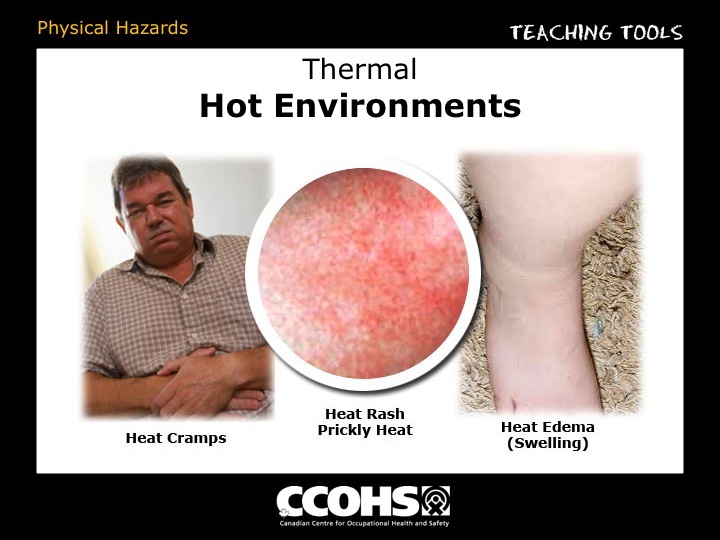 Heat rash, or prickly heat, occurs when blocked sweat glands become inflamed. This painful rash reduces the body's ability to sweat and to tolerate heat. Heat cramps are painful spasms of the muscles. The muscles used in doing work are most susceptible. The spasms are caused by the failure of the body to replace its lost body salts and usually occur after heavy sweating. Heat syncope is heat-induced giddiness and fainting induced by temporarily insufficient flow of blood to the brain while a person is standing. It occurs mostly among un-acclimatized people. It is caused by the loss of body fluids through sweating, and by lowered blood pressure due to pooling of blood in the legs. Heat exhaustion results when the body loses large amounts of fluid by sweating during work in hot environments. The skin becomes cool and clammy. Symptoms include profuse sweating, weakness, dizziness, nausea, and headaches. Heat stroke requires immediate medical attention. The body temperature becomes very high (even exceeding 41°C). Complete or partial loss of consciousness is possible. Sweating is not a good symptom of heat stress as there are two types of heat stroke - "classical" where there is little or no sweating (usually occurs in children, persons who are chronically ill, and the elderly), and "exertional" where body temperature rises because of strenuous exercise or work and sweating is usually present. 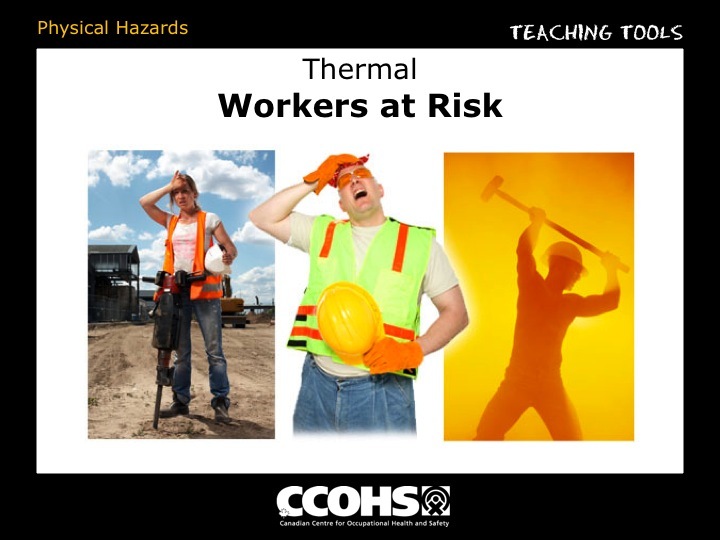 Outdoor workers such as construction, landscaping, maintenance and delivery workers are at risk of such heat-related illnesses. 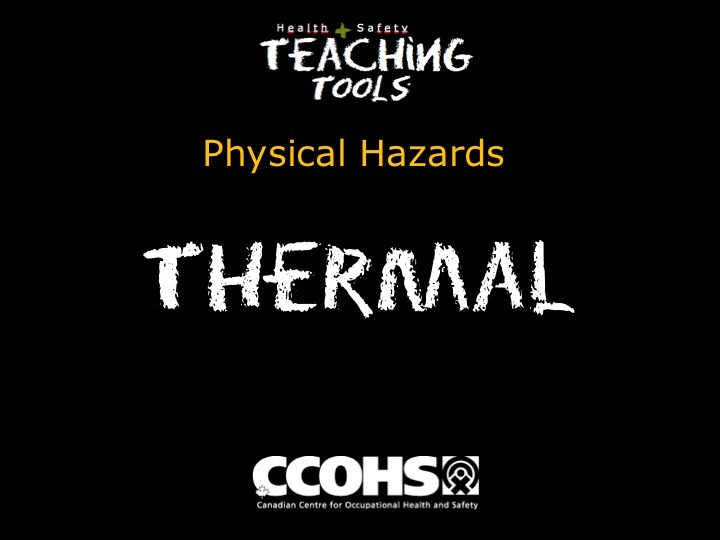 Indoor workers who work in hot environments, such as foundries, bakeries, smelters, and glass factories are at risk for heat illnesses. 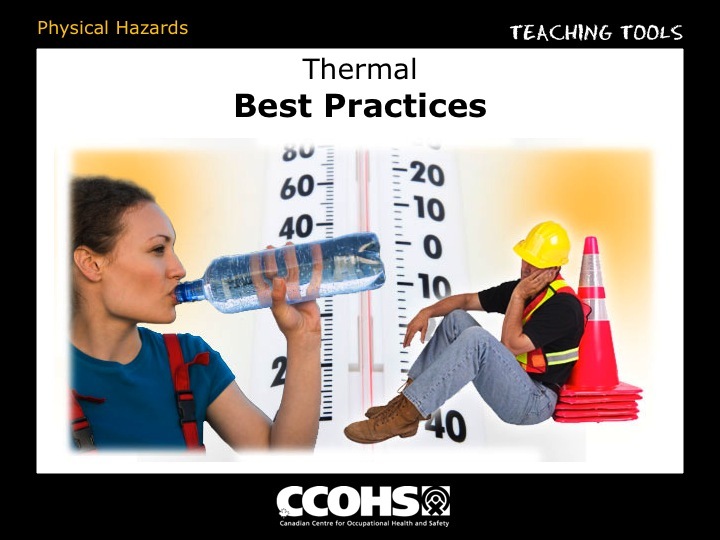 If your work requires you to be exposed to hot environments, your employer should have a program to prevent heat illnesses. Ask your employer what their hot environment plan is. LEARN to recognize heat stroke symptoms in your coworkers and yourself. DRINK plenty of water even if you do not feel thirsty. WEAR loose fitting cotton clothes. TAKE frequent rests; do not over-exert. ACCLIMATIZE yourself to hot weather slowly. 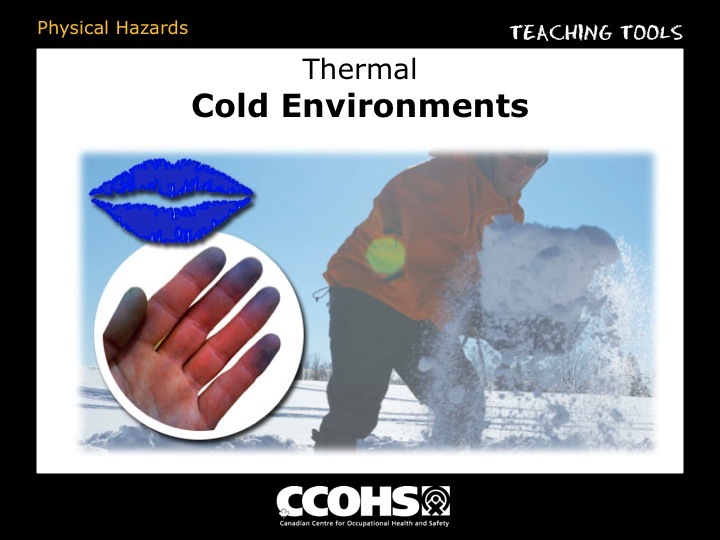 In cold weather, hypothermia results from excessive loss of body heat. It can be fatal if prompt first aid and medical care is not available. To prevent hypothermia dress warmly, and move to a warm shelter when excessive shivering starts.